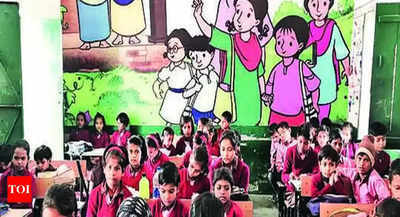 PATIALA: In a move to make the government and private school students share and learn jointly, the state education department has come up with a new idea under which the students of government school will visit the private schools for one day while on another day the private school students will visit the government schools. Surprisingly, the private school students will also have to eat the mid-day meals being cooked in the government schools under the exchange programme termed as ‘twinning of schools’ program. Under the ‘twinning of schools’ program ten students of middle schools from class 6th, 7 th, and 8 th from both the government and private schools will share best practices of their respective schools in May this year. This will be implemented across the state and a notification regarding this has been issued by the Director General of school education Mohammad Tayyab. The District Education Officers in all the districts have been issued directions for preparation of a complete roaster about the ‘twinning of schools’ program. The students will have to spend a full day in each other’s school in order to learn about the academic atmosphere in another school. The instructions have been given regarding the interaction between the students of both government and private schools on various issues. Besides sharing and learning jointly from each other the students will be having discussions on their area of interests, local craft, art and music, and the festivals. They can also share their reading and writing skills with each other while the quiz competitions on various social and environmental issues will be held between the students of both the schools. A special session of folk games in the latter half of the day will also be held. All private schools affiliated with Central Board of Secondary Education (CBSE), Indian Certificate of Secondary Education (ICSE) and Punjab school education board (PSEB) will have to participate in ‘twinning of schools’ program. “One day the students of government schools will visit the private schools while on another day the private school students will visit the government schools in order to exchange ideas. Strict directions have been issued to the schools to make well and proper arrangements for the mid-day meals that will also be consumed by private schools. The visitors will be provided all other required facilities too,” DGSE said. “A sense of interdependence and understanding of each other will be developed. Besides this, it would help in recognizing gap and make efforts to bridge them,” the DGSE added.